Cherif, 32, and Said Kouachi, 34, had been identified as a potential terror threat and placed on a British watch and no-fly list. They had been on UK and US databases as terror suspects prior to the attack. 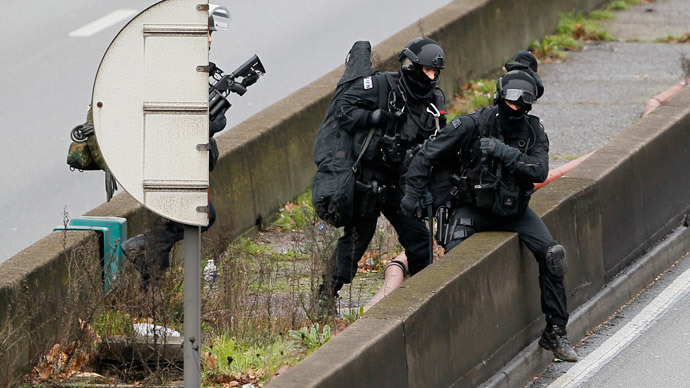 The brothers have been killed after French police stormed a printworks warehouse in Dammartin-en-Goele, where the two suspects in the Charlie Hebdo shootings were holding at least one hostage. French media are reporting that the two suspects, brothers Cherif and Said, have been killed in the operation and the hostage has been freed. The pair was added to the list as potential extremists to deter them from entering the UK or transiting through a British airport. Both were also on the US no-fly list, meaning they were barred from flying into the US, a senior US counter-terrorism official has revealed. US intelligence placed the brothers on the list at the same time as the British. The US government’s Terrorist Identities Datamart Environment (TIDE) system is a database with more than 1 million names of individuals suspected of possible terrorism ties. The younger brother Cherif was convicted of terrorism charges in 2008 and was sentenced to three years in prison for his links to a network sending jihadists to fight US forces in Iraq. Said travelled to Yemen in 2011 and was trained by an Al-Qaeda’s affiliate there before returning to France, a senior American official said on Thursday, according to the New York Times. He reportedly spent “a few months” training in small arms combat, marksmanship and other skills. Both French and US officials were aware that the Kouachi had trained in Yemen. However, due to stretched resources, French security services had stopped watching them because there are too many suspected jihadists in France to keep track of. This is said to put further pressure on French authorities to explain how the brothers were able to carry out the terrorist attacks while French intelligence services were aware of their terrorist activities.